Finding yourself can sometimes (emphasis on the word sometimes) be a glorious process. My experience so far with Chicago Semester has contributed to that process so much in the last twelve weeks. Being a part of this program and living as a professional in this city, you’d think you would hardly ever be alone and that there is always something social to do. That’s not necessarily the case considering I have found myself to be alone in many instances. Now, this isn’t a bad thing. When you spend enough time by yourself in such a new and different setting, you start to focus on yourself more. And when you focus on yourself more, you appreciate the little things. I’ll break it d own like this: my daily routine has differed a lot and it’s been my true key to happiness in Chicago. When my alarm would go off in the morning, I used to immediately scroll through Twitter, Instagram, and Snapchat, and if I really wanted to put off getting out of bed, I would check every and any other app on my phone. Now the first thing I do is read from a daily devotional book called Jesus Calling and pray. It is amazing how entries in that book apply to my day and can make it so much better. One of the next things I do is make my bed before heading out to run. Making your bed may sound silly, but when I come home after working 8+ hours, there is just something so incredibly satisfying about crawling into a made bed. AND RUNNING. 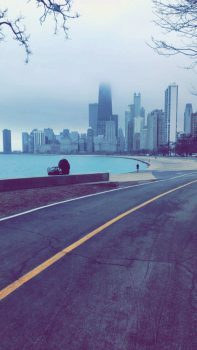 It blows my mind how much better my day goes when I start it with a run on the Chicago Lakefront Trail. Endorphins are the best and with a view as spectacular as the skyline above Lake Michigan, it truly is a glorious experience. The next few “little things” aren’t part of my daily schedule, but I most definitely tribute the discoveries to my time here in the Gold Coast. Less than two blocks from my apartment is one Barnes and Nobles book store, a taco restaurant, and a yoga studio. Reading, tacos, and yoga are all little things that have impacted my happiness in such a good way. All in all, I would not have noticed these things about myself and made the positive changes to my daily routine that I have without this exact experience. As I come up on the last few weeks I continue to truly admire every little thing about this journey.